or studio in the world. All you add is practice! NOW AVAILABLE ON-LINE – PAY ONCE, PLAY FOREVER! I’ve known Roy Vogt for more than twenty years. He has been a close friend, a teacher, a mentor, and now a business partner. When Roy first told me he was creating Teach Me Bass Guitar (or TMBG for short), I was so happy for him! He’s not only one of the finest teachers on the planet, he’s also a wonderful person who has given tens of thousands of hours to others as a teacher, mentor, producer, band leader, arranger, session and career coach and much more. I immediately told Roy I would do whatever I could to help promote the course. Even though I hadn’t seen a minute of footage, I knew Roy would do his usual superb best. And boy did he ever! Over the months, one thing led to another and I eventually served a short stint as VP, Sales & Outreach for The Learning Dock, LLC (TLD), publishers of Teach Me Bass Guitar. And while I am no longer involved in the company, I am still one of Roy’s most ardent supporters, and a sincere, dedicated promoter of his new course. In addition, TLD is an amazing company that’s going to change the way we learn in the 21st century. Sure, there are other DVD courses available, even online lessons. But there’s never been a course like Teach Me Bass Guitar. Here’s the short version: if you want to learn to play bass, or are a beginner to advanced-intermediate player who wants to refine their technique and build their chops, Teach Me Bass Guitar is for you. There’s no other course like it on the planet – not even close! In Twenty Lessons, you’ll get as much information as you’d get in more than FOUR THOUSAND DOLLARS in private lessons with Roy! If you’re serious about playing bass guitar, put down the toys and get this course! Teach Me Bass Guitar has everything you need. All you add is practice – as little as 15 minutes a day. Follow along as Roy teaches you in easy to understand steps, until you’re ready to take any stage or studio by storm. It’s just that easy! If you’re really ready to to learn to play electric bass, hit the order button below and get your copy of Teach Me Bass Guitar today. (Take my advice, and get the companion workbook in printed form, as I find that much easier to use than the PDF version. It’s worth a few extra dollars.) Get started learning electric bass guitar today! When you order Teach Me Bass Guitar, choose the package that’s right for you: digital or DVD. If you choose digital, you will receive an email with instructions. Here’s the best thing – you can download lessons to your device, or you can stream them directly from the server. Or both! How cool is that? To learn more about digital streaming, visit the Teach Me Bass Guitar site. If you order TMBG through this page, I’ll schedule a Skype call with you once your package has arrived to help you get the most our of your course. If you don’t Skype, we’ll have a phone call instead. I’ve played bass guitar for more than 40 years, and I’m still learning from Roy. Keep in mind that I’ve had access to his knowledge in various ways for over 20 years! I’ve read hundreds of online lessons and had thousands of online and telephone conversations with him about technique, theory, line-building and more. Even so, there’s new material for me in Teach Me Bass Guitar. Even in the early lessons, I was reminded of concepts that needed a little review. In the later lessons, I refined techniques that were weak, and learned new concepts, techniques and theory. So if this old dog – who has forty years on the instrument, and 25 years as a pro – can learn new tricks from Teach Me Bass Guitar, imagine what you can learn! And I’m not the only one who has many years on the instrument who finds serious value in the course. Every week, I hear from other Teach Me Bass Guitar students who have been playing 5, 10, 20 years and more, and they love the course! Buy Teach Me Bass Guitar Now – Save 25%!! The real-time fretboard makes it very easy to see where to place your fingers. Access the Loop Library at any time. This is one of the coolest features of Teach Me Bass Guitar. As Roy plays a riff on the electric bass, you see the actual notes, played in sequence as Roy plays them! Even the letter values are displayed – all on a graphical on-screen fretboard. You won’t believe how much easier this makes the learning process. Every dot teaches you where to put your finger and the name of the note – at the same time! That’s just one of the ways Teach Me Bass Guitar is changing how we learn for the better. And there’s more where that came from…Roy presents a lot in each lesson, so there’s only time to play each exercise once. But you’ll want to play them a lot. No problem! Jump to the Loop Library, and play the exercise as many times as you like, with Roy playing right along with you. You’ll know an exercise is in the Loop Library when the moon to the right of the fretboard (Ralph) turns blue.Just press enter on your DVD remote, or click on him with your mouse to jump straight to that loop. Here’s a tip: I always tell my own students to play an exercise perfectly, ten times in a row. That way, you know you know it. That might take you a few sessions to perfect, but if you stick with it, the results are well worth the effort! So, we have a magic fretboard, a moon that turns blue, and an extensive Loop Library of every exercise, song tutorial, and play-along track with Roy’s Urban Legend Band of top session pros. And that’s just for starters. Are you starting to see just how amazing Teach Me Bass Guitar is? and Get Started Learning Bass! and Try it for 90 DAYS!! Beginning with Lesson 2, every lesson includes two original songs by Roy based on the concepts from that lesson. It’s amazing! For starters, this isn’t some bunch of Muzak Drones that couldn’t hold a groove if you glued it to their hands, limping through some lame excuse of a song. These guys eat Master Sessions for lunch! Take a look at the video below, shot in June, 2009 at The Low Show during the Summer NAMM. That’s me playing 2nd Bass with Roy the Urban Legend Band – the same band you’ll be playing with on Teach Me Bass Guitar. As I said, every lesson includes a pair of songs to learn. First, Roy offers a tutorial on each section of the song, one at a time so you can get each part down before moving on. And, yes, these are all in the Loop Library. The next step is to bring in the band. First, Roy plays with you, and at a reduced speed so you can make sure you play each note perfectly. Then you’ll play with the band by yourself, but still at slow speed.Before we move on, let me repeat this: starting with Lesson 2, you’re playing with a studio band! In a matter of days with Teach Me Bass Guitaryou’re playing with pros!Here’s another tip: Before moving up to normal tempo (speed), play the song at slow tempo without Roy a second time. But this time, turn around! That’s right; turn away from the monitor. Now, you’re not watching the music – you’re playing it from memory! Just like thousands of bands do every night – in clubs and on stage around the world! It’s getting clearer that Teach Me Bass Guitar is by far the best, isn’t it? Make sure you get the companion work book. It’s worth it’s weight in gold! The folks at The Learning Dock, LLC, are a pretty conscientious lot. They know that a lot of people today work hard to conserve natural resources. 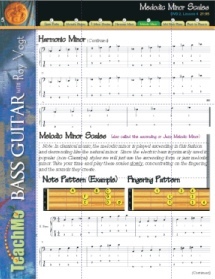 To help with that, they decided to include the Teach Me Bass Guitarworkbook (over 160 pages!) in PDF format, on disc 5 of the course. It’s full of illustrations in full color, including photos and examples of all the things Roy covers in each lesson.The PDF workbook also includes easy-to-read charts and notation for all the musical examples presented in the videos. And it’s split into chapters so you can print them one at a time, or print the entire chapter. Just explore the disc on your computer and you can view or print at will.If you’re like me, however, you’ll want a hard copy of the entire workbook. Which means you either have to print, or take the easy way out. (In this case, I’m all about the Easy Way.) Just add the optional hardcover workbook of your choice: black and white, or full color. Both versions are spiral bound which makes it easy to deal with on a music stand or other flat surface. (Get serious, get a music stand, will you?) The paper is of such high quality that when I show it to people in the real world, I hold it up by an inside page, with the entire 160+ page book hanging by a single page! That kind of quality and attention to detail is one more reason Teach Me Bass Guitar is the best there is! The following samples are pulled from the Teach Me Bass Guitar You Tube channel. These will give at least a beginning of an idea just how comprehensive this course really is. These are just short clips – and are shown at 1/8th their actual size, by the way. Over SIXTEEN HOURS of Lessons! Those two samples are just the tip of the iceberg. There’s a whole lot more to Roy’s Teach Me Bass Guitar. Dozens of concepts, scales, exercises… more than enough to keep you busy and progressing for a long time to come.Plus there’s over two dozen original songs with the same band you saw in the video above, each offered in four levels of difficulty. Can you see now what they say that Teach Me Bass Guitar will prepare you to take your place on stage and in the studio?Only for the Serious!Teach Me Bass Guitar is for serious musicians, or people who are serious about becoming musicians. Look, there are plenty of cheesy little programs out there to waste your money on. You could buy a dozen of them, spending more than a thousand dollars, and you still wouldn’t get everything you’ll find in Teach Me Bass Guitar. There’s simply no other course that comes close! In our Instant Gratification Society, everyone tries to convince you that you can become a serious musician without working at it. But can you name any activity for which that’s true? If you want to be a star baseball player, you have to practice. If you want to be a top skateboarder, you have to take your lumps. If you want to be the coolest guy in school, you’re going to need new clothes. IF YOU WANT TO REALLY LEARN TO PLAY ELECTRIC BASS GUITAR, YOU HAVE TO PRACTICE – AND YOU NEED A TOP TEACHER TO HELP YOU. AND THAT’S EXACTLY WHAT YOU’LL GET WITH Teach Me Bass Guitar. Excellence isn’t something that drops in your lap while you’re playing video games. Unless, of course, you want to be excellent at video games. Anyone who tells you that learning to play electric bass guitar won’t take work is someone you shouldn’t trust. Roy will supply you with all the knowledge and technique you need, but only you can provide the will to succeed, the drive to practice, and the determination to be as good as you dream of being. If you’re that committed, you’re in the right place. 1. You’re not really serious about playing electric bass. That’s cool. If you’d rather grab a plastic guitar-like game controller and sit on the couch munching Cheetos and playing kid’s games, go right ahead. But don’t think that you’ll ever become a bass guitar player by doing that. If you’re really ready to learn, you need Roy Vogt’s Teach Me Bass Guitar. 2. You’re worried that it might not be worth it. That’s cool, too. You’ve read everything I had to say about Teach Me Bass Guitar but you’re not convinced. No problem. Don’t take my word for it. Order today. Try it for a full ninety days. And if you don’t agree that it’s the best electric bass guitar instructional course in the world, send it back for a full refund (less S&H). You’ll have three entire months to prove to yourself that everything I’ve told you about Teach Me Bass Guitar is true! So go ahead and grab your credit or debit card – because sending cash over the Internet is still pretty hard to do – and order Teach Me Bass Guitar today! Stop Playing and Start Learning! If you’re really ready to learn to play electric bass guitar, you need Roy Vogt’s Teach Me Bass Guitar. There simply is no better – or easier – way to learn the Greatest Instrument on Earth! So put down the toys. Throw away those chump-change, teach-nothing courses and get serious! Order Roy Vogt’s today! One day, when you’re on stage in front of hundreds – even thousands – of fans, you’ll thank me.